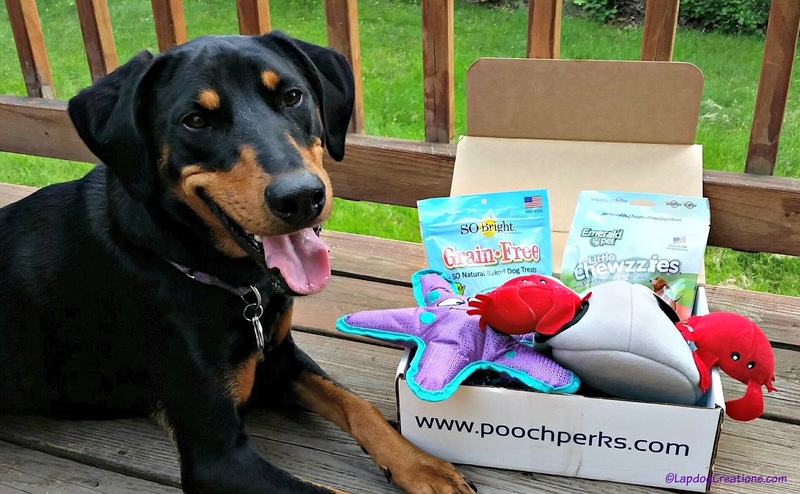 Disclosure: Pooch Perks sent a June box to Lapdog Creations, free of charge, for review purposes. We only share information that we feel is relevant to our readers, and all opinions expressed are our own. If you click on our affiliate links and subscribe, we may receive a few pennies to help maintain this blog. The Lapdogs' favorite thing about turning the calendar forward each month is the arrival of their Pooch Perks Inc. box. 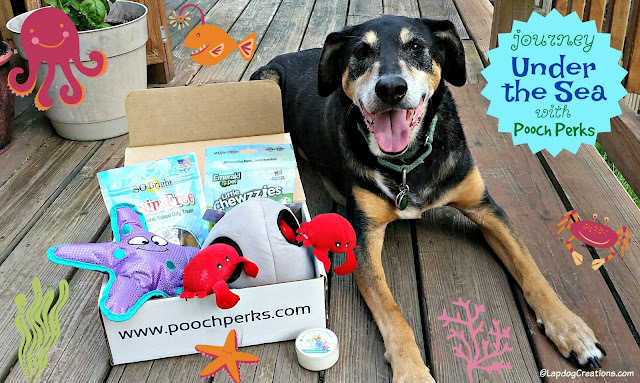 They can't wait to see what new toys and treats are stuffed inside, and I can't wait to see what fun theme those Pooch Perks folks have come up with. June's theme is Under the Sea, which reminds me of home... minus the tourists, of course! These grain-free, oven-baked treats are crunchy and quite tasty according to Teutul. I love that they're from a family-owned business in Wisconsin. This interactive, hide-and-seek toy is great for playing with your dog. Stuff the crabs inside and watch as her nose goes to work and she digs them out of the burrow. 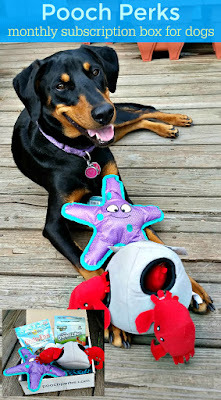 Since the crabs are on the small side, I would only use this toy for supervised playtime. These new-to-us, limited ingredient tiny treats are perfect for both small and large dogs. They are free from wheat, corn, soy and dairy, as well as artificial ingredients, colors and flavors. Plus, they're just 5 calories each! We'll be using them for training. It squeaks, it's chew resistant, and it's adorable! Great for tugging, tossing and fetching. We've been fans of One Fur All and their odor-removing, pet-safe candles for a long time. This one smells amazing! The Lapdogs are loving everything about their sea-filled box... except maybe that candle. They could care less about something they can't eat or play with, but that's okay because Mama loves it. I also love that they are getting to enjoy two new-to-us salmon treats this month. Got a friend with a new puppy? Check out their special Welcome Home Puppy Kit. 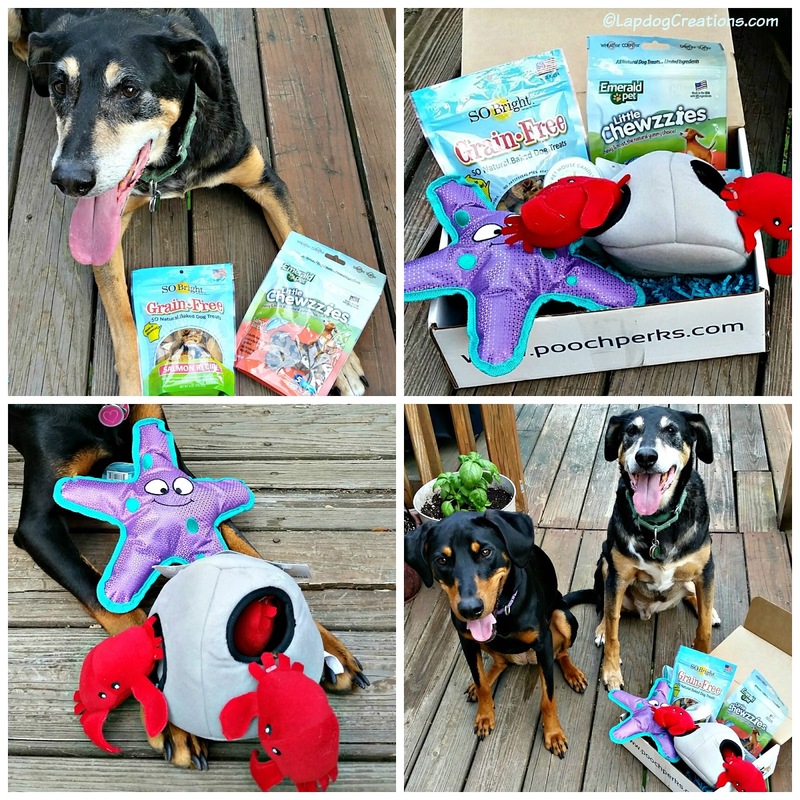 And for those special dogs in your life who are celebrating a birthday, order a Barkin' Great Birthday Box. I really like this one! If I order today, do you think we could get this one? Aw! The Lapdogs are smiling! I took your advice and ordered the doggy DNA test for Bebop. Chewy's service was great. That looks like the best box yet. Mom gets all goofy about fish and lobster toys. She says she wishes there were boxes like that when she had just one dog. Now she buys toys in bulk.